Discussion in 'Eschatology - Endtimes & Prophecy Forum' started by Bipolargirl, Jan 10, 2019.
do you think the book of revelation is written in order? The book of revelation is confusing to me. Absolutely not. The book of Revelation is written in a style called "Progressive Parallelism", which means it retells the same events multiple times in progressively more (or less) detail. Ironically its purpose is to improve understanding. The reason we know it's written in this style is because we see multiple things repeated throughout. For example... Revelation 11 and Revelation 20 both tell us it's time for the judging of the dead. Revelation 11 and Revelation 22 both tell us that God and his son have begun their eternal reign. The kingdom of the world has become the kingdom of our Lord and of his Messiah, and he will reign for ever and ever. And Revelation 16 and Revelation 21 both tell us that God's plan has come to completion. There are other examples, but those three are the most obvious and the least disputable. Revelation tells the story of the Great Revolt over and over again, each time imparting different morals and applications. Agree with the two posters above. Even though Residential Bob is a full preterist. Revelation tells the same story seven times. There are different opinions on that. But the important thing is: the antichrist loses, and God wins. So, we just should have faith and be watchful as to not be deceived? Yes; and be confident that Satan will be defeated. Indeed, he has already been defeated. It's VERY helpful and also brief and also available for free at the link provided. I suppose it is fear that I might be deceived or tricked into taking the mark. Sometimes I worry we are already marked (but that’s anxiety). No, you can't accidentally join the forces of Satan. And the "mark" is either in the past or in the future (depending on who you ask). There is no "mark" right now. No, it's not in order. It begins, ends, and then begins again, often overlapping. Remember that it is a religious work and written in the religious language of the time. To us it can seem to not make much sense, but the people it was written to, in understanding the language, understood what it meant. No, you can't accidentally join the forces of Satan. Actually that is exactly how most people will join with him...not realizing that he is Satan. Ever hear of wolves in sheep's clothing? Think more along the lines of a devil in lambs clothes (and lambs horns). It's written in order just not chronological order. The timeline jumps around a lot. You will not be tricked into taking the mark. It is years away, because there are many prophecies that have to happen first before the implementation of the mark begins. The great tribulation has to start first. The great tribulation begins when there is an image made of the person called the beast and placed into a Jewish temple in Jerusalem - which is not built yet. Revelation the first three chapters are about how Christians are supposed to behave until Jesus comes for us. Chapters 4 and 5, John is prepared to receive from Jesus the revealing of the end time events. Chapter 6 is basically an overview of the seven years of Daniel 9's 70th week. 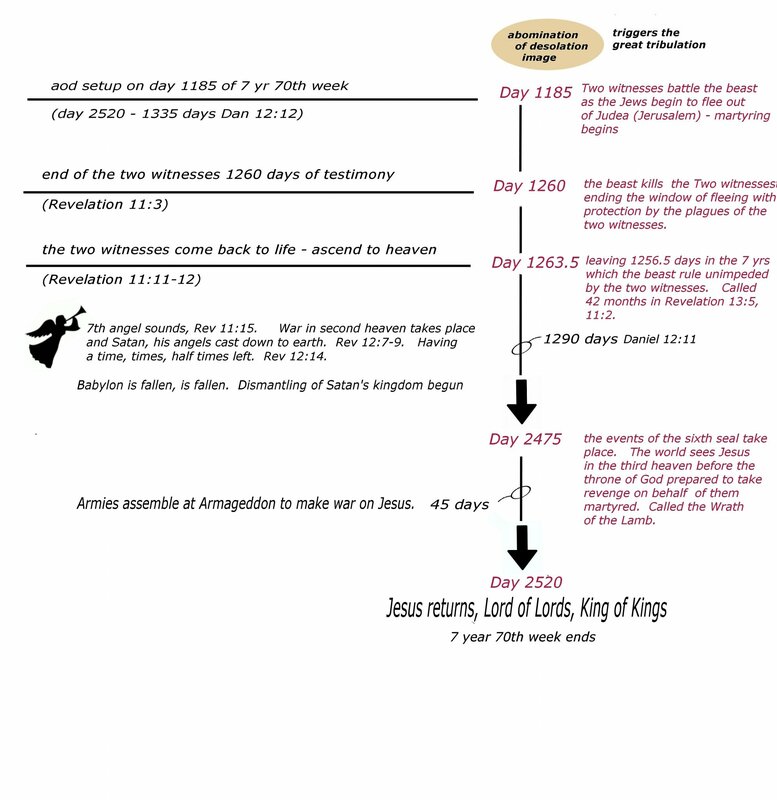 And the rest of the chapters through Revelation 19, are the details of the events that take place over the seven years, mostly about what takes place during the second half of the seven years, ending with Jesus's glorious return. The order of the events are understood by reading and studying the chapters, 6-19. And figuring out where the events go on the seven year timeline. The best way to understand Revelation, the seven years, and the end times events is to study and understand the main arch villain of that time. Depending on what role he is in at the time, the person is called the little horn, the prince who come, the Antichrist, the revealed man of sin, the beast. Here is a chart I made. The person has not yet entered his initial role, basically the leader of Europe. That is we don't know who he is yet. 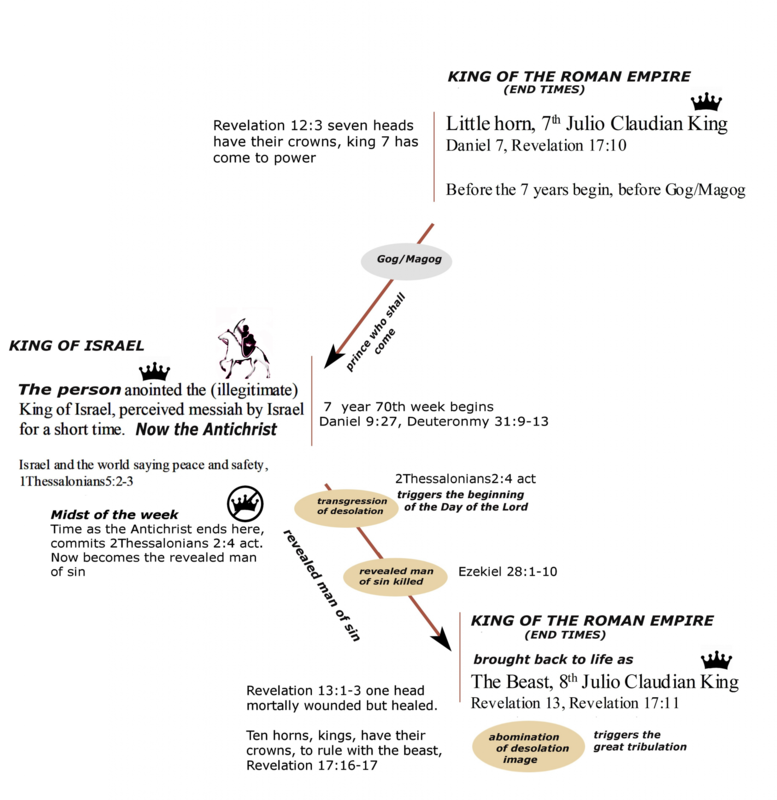 If you are not familiar with Revelation and the end time prophecies in the bible, this chart could overwhelm you. But don't be discouraged. Just start reading and leaning what you can. The Second Coming of Christ is found at the end of chapter 6, with those hiding from the wrath of the Lamb. They would not be hiding, unless the Lamb is present. It is found at the 7th trumpet and "the time of the judgment of the dead", in Revelation 11:15-18. The beginning of chapter 12 is a history lesson, which includes the fall of Satan, and the birth and death of Christ. The Second Coming is found in the "harvest" of chapter 14, which is related to the parable of the wheat and tares from Matthew chapter 13. It is found when Christ comes "as a thief", at Armageddon, in Revelation 16:15-16. It is found in chapter 19. It is found at the end of chapter 20.